Come closer and put your tinfoil hat on. I’m going to tell you something crazy. The government is controlling the weather. That’s right, they are. They spray carbon dioxide in clouds to increase the formation of rain. To like, increase the water supply in a region or something equally sinister! And we’re not entirely sure if it works, actually. Well, ehm, but let me tell you, it’s a conspiracy! If you can’t tell, the previous paragraph was sarcastic. Claims that governments are somehow creating hurricanes and using the weather as a weapon are unfounded. The one method used to ‘manipulate’ weather, cloud seeding, has recently been shown to be much less effective than previously thought. The idea behind cloud seeding is dispersing microparticles (of silver iodide or dry ice) in clouds, to provide a location for snowflakes or raindrops to form. 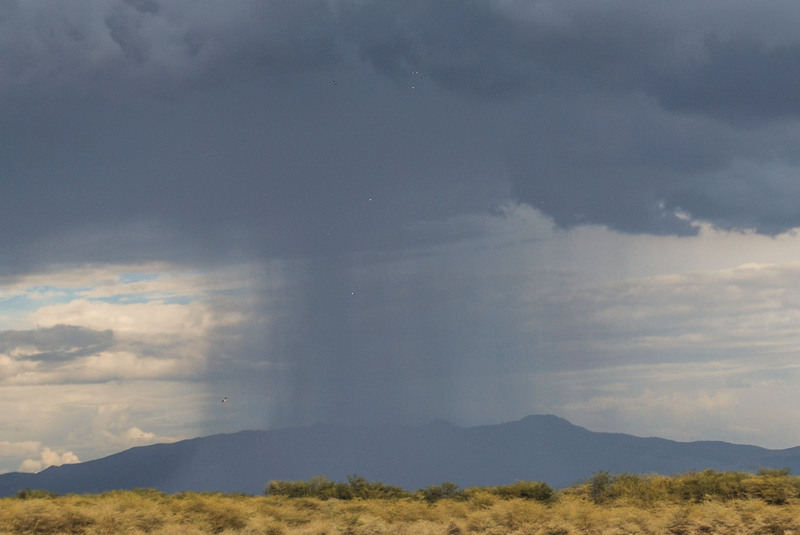 It’s not actually possible to create extra rain, all seeding does is expedite the formation of droplets. It’s a zero-sum game, more rain or snow in one place means less in another. Many countries use it, including China, the US, Russia and Australia, but recent studies have suggested that seeding does not affect rainfall or snowfall significantly. An 2010 Israeli study looked at over 50 years of data and concluded that increments of rainfall were due to chance and not due to seeding. Project Stormfury was a US project which tried to influence hurricanes. Not make them, mind you, but to weaken them, reducing their destructive potential. Ah, those pesky scientists, always trying to save lives. The hypothesis was that if you seeded thunderstorms around the eyewall (a ring of thunderstorms surrounding the eye of the hurricane), the eyewall would expand, creating a wider storm. Because of conservation of momentum, the wind speeds would decrease. Planes would fly in and disperse silver iodide. Several hurricanes were seeded, and the project was at first deemed a success. Afterwards, they found out that this eyewall expansion process was a natural one and the seeding had nothing to do with it, at all. It had no effect whatsoever. Though the project was not a success, the data and observations recorded did help meteorologists gain a deeper understanding of hurricanes. Coating the oceans with a thin layer of oil could in theory weaken hurricanes as it would prevent the formation of droplets. While this might prevent destructive hurricanes, you’d still have a huge intentional oil spill the size of the ocean, so it’s not exactly practical. The High Frequency Active Auroral Research Program (HAARP) is a research project based in Alaska. Their main objective is to study the ionosphere, which cannot be reached by weather balloons. One of the instruments they use is a powerful radio transmitter that excites a small part of the ionosphere. But even though the ionosphere is part of the atmosphere, they are NOT studying or manipulating weather in any shape or form. This has not stopped conspiracy theorists who claim that the facility is part of a secret project to control the weather, to create destructive natural disasters such as droughts, earthquakes, floods, hurricanes and cyclones (and also chronic fatigue syndrome, for some reason) . This is simply not true. Anyone who has an idea of how natural disasters work knows that the energy required or released is enormous, far beyond the capability of man. Also, how would we be able to create the circumstances for such natural disasters? The science we have is not precise enough to even be able to predict them! In 2009, the mayor of Moscow announced that the city was going to have a snow-free winter. Snow-carrying clouds would be seeded before they got close to Moscow. Did it work? Nope. China fired cloud seeding rockets into clouds just before the opening of the 2008 Olympics, to avoid the proverbial rain on the parade. It didn’t rain during the opening ceremony, but there is no actual data to confirm that the rockets actually did anything apart from generating some propaganda. Weather systems are far too chaotic and energetic to be influenced by humans. Think about it, we could, in theory, generate huge amounts of electricity from wind, without significantly affecting weather patterns. If we were to reverse the process, and use our energy to influence the weather, you’d need inordinate amounts of it. Or, if you were to try to create of sort of “butterfly effect” scenario, where a small influence can cascade into a much larger consequence, you would need incredibly accurate models and data, which we simply don’t have. To have such an accurate system you’d need several probes collecting data per every cubic metre of atmosphere, which is of course, practically impossible. Will Yellowstone Kill Us All? Streep, Abe. “The Military’s Mystery Machine: The High-frequency Active Auroral Research Program, or HAARP, has been called a missile-defense tool and a mind-control device. The truth is a bit less ominous”. 06.18.2008. Popular Science.